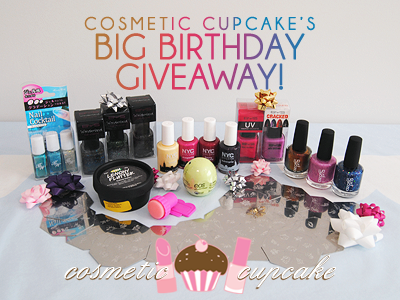 Cosmetic Cupcake: My Big Birthday Giveaway! Today marks the 1 year birthday of my blog. YIPPEEE!! Time has flown by so quickly and I cannot believe I’ve reached this milestone already! It only feels like yesterday that I decided to start blogging as I enjoyed reading other blogs so much. I absolutely love blogging and it's been so much fun sharing my manis, hauls and food adventures with all of you! It’s been wonderful “meeting” so many lovely ladies who also share my love of nail polish and beauty. Thank you all so much for following, commenting and for the wonderful support over the last year, I am humbled and truly appreciate it! My birthday is in March so to celebrate both birthdays I am having a Birthday Giveaway as a way to say thank you to all my wonderful readers! This time there will be TWO lucky winners! Some goodies I love which I purchased from Hong Kong with this giveaway in mind! Beauty World gradient kit in blue and EOS lipbalm in honeysuckle. 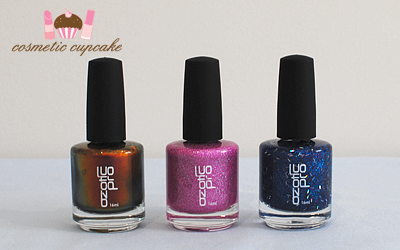 Check out my manicures using the purple gradient kit and pink gradient kits for what to expect. The EOS lipbalms are one of my favourites and I so wish they sold them here in Aus! 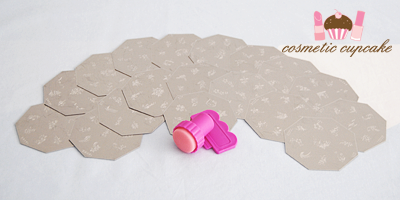 17 GCOCL nail stamping plates (A01 – K05) which includes the awesome Hello Kitty plate A02 plus a generic stamper and scraper. 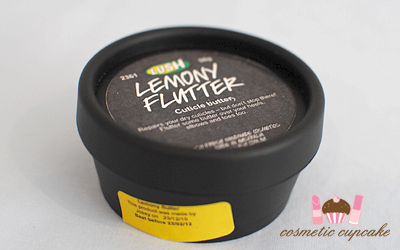 A brand new tub of the very awesome LUSH Lemony Flutter cuticle butter. 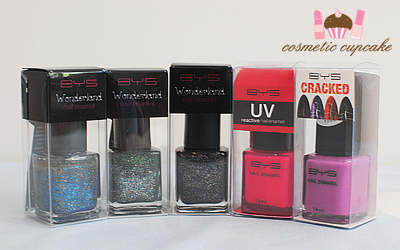 This prize has been VERY generously sponsored by my dear friend Christina from Cels blog!! =D Christina creates stunning Japanese style nail art, decoden and kawaii deco items which she sells in her Etsy store Cels deconails. She has very kindly custom made TWO amazing nail polish rings for me to give away to one lucky winner! This golden sparkly ring is made with OPI Extra-va-vaganza from the Burlesque collection and a sweet pearly heart in a size 9 or L.
This glittery red ring is made with a silver base using TiNS the Mars and the size is adjustable. 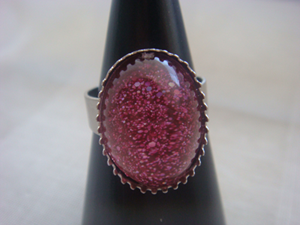 Christina's nail polish rings look fabulous and are beautifully made. They add the finishing touch to any outfit! Make sure to check out Christina's Etsy Store for more wonderful handmade items - she makes other nail polish rings, Japanese nail art items and also iPhone cases and deco items. She will also happily custom make items too so don't hesitate to ask her! I covet every item she makes xD I cannot thank you enough for donating this wonderful prize Christina!!! 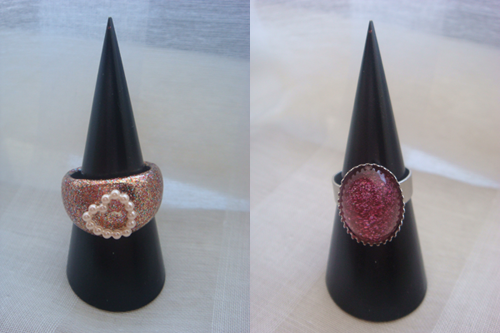 I love these rings so much I am very tempted to keep these for myself instead of giving away haha. Don’t worry I won’t do that though! 4. Like Cels deconails Facebook page. If you already "like" her page that certainly counts! (1 entry). Please fill out the form below with all your entries once to enter! Please do not submit your details in the comments of this post - I will NOT count these. Giveaway is open internationally and will close on March 6th at 8pm Australian Eastern Standard Time. congratulations on a year! thank you! Congratulations and to many more years! Great giveaway, love the prizes! You have a great giveaway and I am glad that i stumbled on your blog! =) Happy Blogversary and advance happy birthday too! HAPPY BIRTHDAY:) And good luck to everyone. Happy blogging birthday!! May it be the first of many. Good luck to all the participants and thank you for organising this giveaway. Congratulations on your blogiversary! I've only been following for about 4 months (I think since around the time of your last big giveaway?) but you became my favourite nail blog in a very short amount of time. I always look forward to seeing your posts and hope there are still many yet to come! Thank you for sharing your wonderful talent with us. Great giveaway too, lots of variety. And I love that included a gradient set in my favourite colour, I love blues/teals. What a massive prize :D Happy birthday to your blog! Congrats! and thanks for being such a sweetie and having such a generous giveaway!! Great! I have filled it in! Great giveaway! So easy to get so many entries - I did almost all of them. waow ! thanks for this BIG giveaway and happy birthday !!! Really amazing, i hope i win. Love this kind of giveaway.. sweet. please check out my ELF 83-piece makeup palette and nail polish set giveaway! Thank you all so much for your wonderful comments, well wishes and support! A BIG thanks to my readers from the start and hello to my new ones! Felicidades guapa!! El sorteo es super bonito! Un beso. Congrats! :) And that's an awesome giveaway! thanks for this giveaway! it is amazing!! wow this is such an amazing giveaway! thanks a tonnE! Thanks for this great giveaway! Congrets for your blog anniversary! awesome giveaway! ^_^ you totally deserve more birthdays! Thanks for this great giveaway and congratulations with your blog birthday!! !